Having taken two games of three against the Cardinals in St. Louis, the Boston Red Sox are only one game away from clinching a World Series at home for the first time since the Wilson Administration. Should they fail tonight, they have another chance tomorrow. 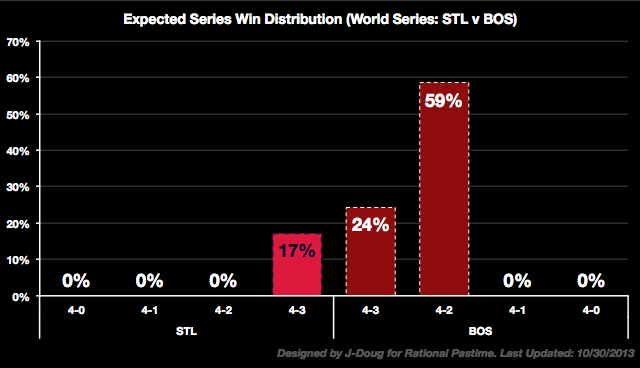 It's no wonder then that Rational Pastime's postseason projection model is giving Boston an 83% chance to win it all. The two remaining home games give the Red Sox a 9% advantage—as if they needed any. The Cardinals' odds of salvaging their third Fall Classic in eight seasons are a paltry 5:1. That said, I was wrong about them the last time I did these projections. I could be wrong again (it happens). The projection system gives the Red Sox about a 59% chance to win either Game 6 or 7. This is probably a bit higher than their true edge, given the pitching that Boston will face in these games. Nevertheless, the system does not expect there to be a Game 7. 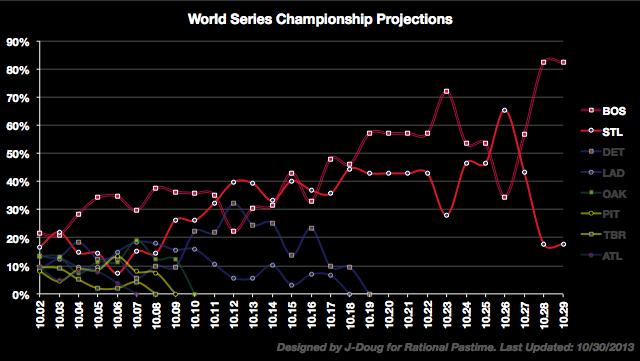 This postseason's most common projection—Sox in six—may come true after all. Tune in tomorrow for either projections of a momentous Game 7 or a postmortem of Rational Pastime's projections for the 2013 MLB Postseason.